MyHeritage Reviews - Is This DNA-Based Ancestry Service Worth It? MyHeritage offers CLIA-certified DNA testing services that can help customers gain greater insight into their ancestry while building detailed family trees and searching billions of records. Advertised as the leading global destination for discovering, preserving, and sharing family history, MyHeritage is an online service that allows members to undergo DNA testing, search billions of international records, and easily create a family tree with names, dates, photos, and personal stories. Additional services include the ability to stay in touch with family members, participate in scientific research, and Smart Match and Record Match technologies that notify you via email as soon as they reveal “new family tree connections, records, and newspaper articles about your ancestors.” You can also collaborate with other members and research from any device at any time. Together, MyHeritage promises to host more than 96 million users, three billion profiles, and 41 million family trees. But, does that necessarily mean that they’re your best option? Give us a few minutes, and we'll condense this potentially complex topic into easily digestible bites that can help you make a more informed decision. Global Name Translation – Claims to translate “names found in historical records and family trees from one language into another, to facilitate matches between names in different languages." At the core of all these services is their DNA testing, so let's zoom in and take a much closer look. DNA makes us who we are. Its dozens (or millions) of nitrogen bases form genes, which then form chromosomes—half of which we receive from each of our parents, and are cumulatively responsible for all of our inherited characteristics, as well as our differences. And since every cell in our body contains this unique genetic code, DNA tests can extract data from it, such as the potential for acquiring certain diseases (including many cancers), the potential for passing potentially harmful genetic variances on to children, along with genealogical information. Then, the biological information contained in your DNA is converted into digital form, at which point the company’s “algorithms calculate your Ethnicity Estimate, determine which segments of your DNA originate from different regions in the world, [and] compare your DNA to the DNA of others” to show how closely related you are. Note: Compared to some other companies, MyHeritage doesn’t just compare their own results, but also results uploaded from other users and obtained from sites like 23andMe, Family Tree DNA, and Ancestry DNA. 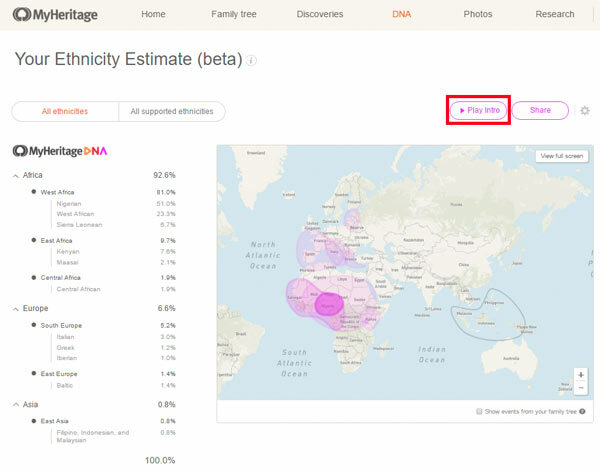 An example of MyHeritage’s DNA results page. Credit: MyHeritage Ltd.
On your part, it only takes two minutes for a simple cheek swab (no spit or blood involved), at which point you’ll mail everything to MyHeritage’s lab using a pre-paid envelope. You’ll receive your results online within four to six weeks. All data collected during the process is secured and protected by multiple layers of encryption. An example of MyHeritage’s Ethnicity Estimate. Credit: MyHeritage Ltd. This includes a list of regions both sides of your family came from, "as well as the percentage of your DNA that comes from each area." Based on the information learned from your DNA analysis, you can start a family tree on the MyHeritage website by entering a few names, dates, photos, and stories into their Family Tree Builder software, and then share with the rest of your family. You can also import an existing family tree, as well as GEDCOM files. From there, the company’s Smart Matches technology will match your tree to millions of others and help you automatically discover new relatives, as well as uncover historical records of ancestors. Based on the information you input, you can create customized charts and reports, as well as view maps to see where your ancestors came from. All of this data can be uploaded to a private, secure family site for everyone to enjoy, and everything automatically syncs with their free mobile app. Simply search by names (first, middle, last), year of birth, place, keywords, or even location, and they’ll help you uncover more about your family. While DNA Kits (two vials, two cheek swabs, instructions, activation card, one plastic bag, and return envelope) are priced at $79, basic MyHeritage memberships are completely free. You’ll have the ability to build a family site with up to 250 individuals and up to 500 MB of stored documents, such as photos. Premium: $94.99/yr – Provides access to expanded family tree size, as well as to Smart Matches. PremiumPlus: $94.99/yr – Unlimited family tree size and Smart Matches, in addition to Instant Discoveries. Data: $119.99/yr – Provides access to more than nine billion historical records, as well as the Record Matches service. Complete: $179.99/yr – Includes access to the entire MyHeritage platform. Many of these options also include priority support for faster answers, which can be reached at 800-987-9000. The company also offers a paid backup service that “backs up your family tree once every month and sends you an email notification with a link to download the backup onto your computer,” as well as the ability to hire a researcher. In October 2017, PCmag’s Molly K. McLaughlin ordered MyHeritage’s DNA test and found the results were dramatically presented and easy to understand. She also appreciated the included family tree software and research resources. However, she reported their ‘insert and break’ sample collection process was a bit tricky, and that their well-present results didn’t provide deeper context “to help you interpret the results or learn more about how your ancestors lived.” She also encountered many more DNA matches with other services she’d previously tried. On the other hand, more than 1,700 TrustPilot readers gave MyHeritage an average rating of four stars, with common compliments referencing excellent customer support, ease of use, and informational results. The relatively few complaints related to less-than-stellar results, functionality concerns, and support issues, although a company representative responded in each instance. We encountered more than 45,000 combined user reviews between Google Play and iTunes, who had cumulatively given the MyHeritage app an average rating of about 4.2 stars. Compliments and complaints were more or less in line with those found elsewhere online. As a company, MyHeritage Ltd. has been in business since 2003 and was founded by CEO Gilad Japhet. Their US operation is based out of Lehi, UT and held an A+ rating with the Better Business Bureau, as of 5/24/18. This was based on 180+ customer reviews and more than 200 closed complaints, which related to everything from billing issues to information concerns. Again, a company representative responded with a solution in each instance. 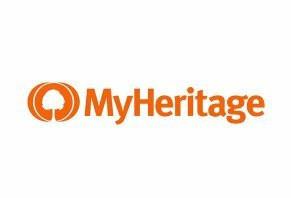 Are There Other Companies Like MyHeritage? From a high-level perspective, there are two main types of companies within the industry: medical (carrier screening, prenatal testing, predictive and presymptomatic testing) and entertainment (ancestry and lineage, aging, food sensitivities, fitness, etc.). Obviously, we can see that MyHeritage falls in the latter category. But, do they have any competition? In short, yes. There are a handful of other DNA-based ancestry companies in the marketplace, many of which share similarities like using a saliva sample for DNA collection, processing the DNA in CLIA-certified labs, and large DNA collections for comparison. As we can see, MyHeritage does appear to have the most affordable price on the market, as advertised. But does that necessarily mean they’re your best option? Let’s answer this question in the next section as we wrap things up. In our guide to at-home genetic tests, we interviewed Ellen Matloff, a certified genetic counselor and president and CEO of My Gene Counsel, who emphasized that many of these at-home tests are “simply genutainment – genetics entertainment.” In other words, in the instance of companies like MyHeritage, they’re not intended to do anything other than provide information about your ancestry. So, if you feel that the cost of one (or more) of these DNA tests will provide an equal level of entertainment for the value, it might largely come down to a) the exact price you want to pay and b) which company offers services that closely align with your needs and preferences. 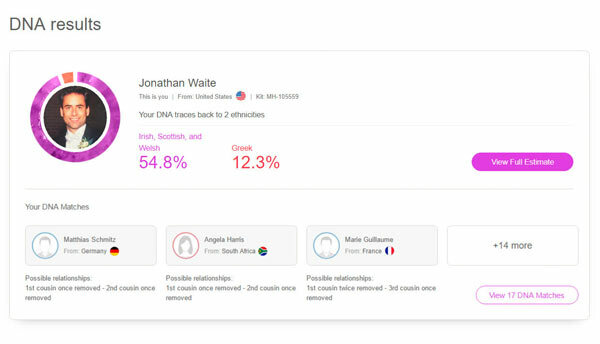 With all of this said, MyHeritage has been in business for years, has garnered mostly positive online customer and professional feedback, and comes with the lowest current price for their DNA tests. So, if these are important factors in your ancestry search, it doesn’t seem you’ll end up disappointed. » For Further Reading: Pros and Cons of an At-Home Genetic Test: Should You Try It? Write a Review for MyHeritage!